Looking Sideways x Endeavor x Vans Boards — BORN Motor Co.
Creativity and action sports have always gone hand-in-hand – a crowd-sourced mural into an exclusive range of Looking Sideways x Endeavor x Vans Snowboards. The project came about as part of the huge exhibition at the Vans Wangl Tangl event in Austria back in March 2012. Artists featured included Ed Templeton, Schoph and Blaise Rosenthal, but one of the key exhibits was a huge mural created from images of eyes looking sideways sent in by visitors to wearelookingsideways.com site. 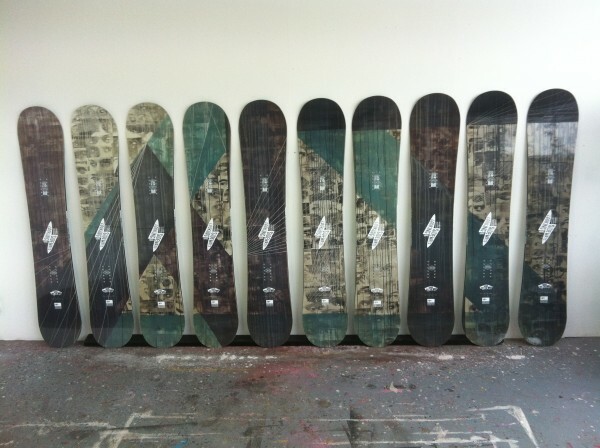 Once the show was finished, they took the mural down and used it to make the graphics for a set of ten super exclusive LS x Endeavor x Vans boards – check the film for a quick overview of how the entire project went down….